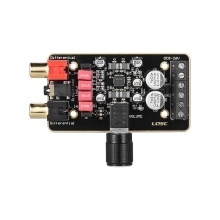 Dual-channel digital audio amplifier module with DC 8-26V working voltage & 15W + 15W output power. Equipped with black copper terminal blocks, imported WIMA red audio capacity, large-capacity filter capacitor for channels and gold-plated audio input terminals. With 2 * RCA input ports & 1 * 3.5mm input port, and a volume control knob(clockwise to turn volume up and counterclockwise to turn volume down). Features over 90% high efficiency, less than 0.2% total harmonic distortion, low quiescent current and noise suppression. Designed with input reverse connection protection, short circuit protection, over heat protection, over current protection and over/ low voltage protection; what&apos;s more, EMI is allowed to pass.